Vince Calhoun, one of the world’s foremost experts in brain imaging and analysis, has been named the founding director of the Center for Translational Research in Neuroimaging and Data Science (TReNDS) at Georgia State University. Calhoun will be professor of psychology at Georgia State, with secondary appointments in the departments of Computer Science and Physics and in the Neuroscience Institute. In addition, he will have appointments at the Georgia Institute of Technology in the School of Electrical and Computer Engineering and in the Wallace H. Coulter Department of Biomedical Engineering at Georgia Tech and Emory University. He will have additional appointments at Emory in the departments of Neurology, Psychiatry and Behavioral Sciences and Radiology and Imaging Sciences. 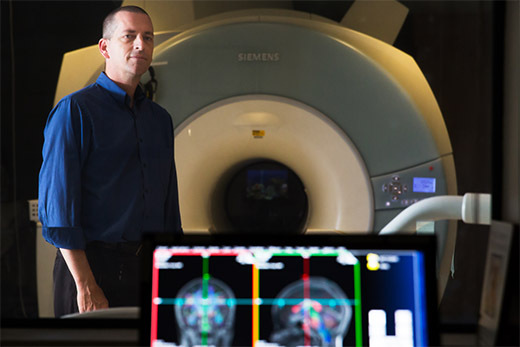 Calhoun is joining the university as a Georgia Research Alliance (GRA) Eminent Scholar in Brain Health and Image Analysis, becoming the first eminent scholar with appointments at three institutions. “We welcome Dr. Calhoun to Georgia. Vince will be a prominent member of the brain research initiatives at both Emory and Georgia Tech, and the Georgia Concussion Research Consortium,” said Susan Margulies, the Wallace H. Coulter Chair and GRA Eminent Scholar in Injury Biomechanics and chair of the Wallace H. Coulter Department of Biomedical Engineering at Georgia Tech and Emory University.